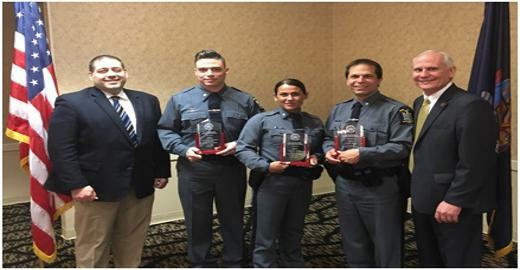 On May 1, 2017 at the Central New York Association for Chiefs of Police Awards Banquet, the Association honored three Upstate University Police Officers, Jonathan Christian, Joseph Nappo and Victoria Tolkan as well as a State Corrections Officer Gregory Edgar with a Law Enforcement Commendation Award. This was for an incident that occurred on November 14th 2016 when an emotionally disturbed subject entered the lobby of University Hospital yelling and brandishing a knife. The subject was distraught and threatening to harm/kill himself as well as others..
As the event unfolded the officers were notified by the County 911 center that the subject was also wanted in conjunction with a similar menacing incident that occurred at another location in the city of Syracuse fifteen minutes prior to this.. The quick response and action of the officers by using non-confrontational de-escalation techniques potentially avoided serious injuries to the subject as well as innocent by-standers as the lobby was full of visitors at the time. 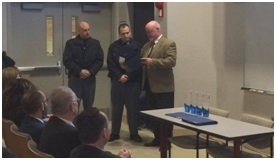 On January 26th Police Officers David Cohen and David Giocondo were recognized by University Hospital’s leadership. Officers Cohen and Giocondo saved the life of an individual that was brought to our facility that had overdosed on heroin. While the victim was still in her vehicle and unresponsive Officers Cohen and Giocondo administered Narcan, an antidote commonly used for heroin overdoses and were able to save her life. 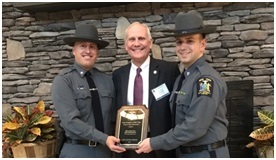 In May Your University Police Department was named ‘Law Enforcement Partner of the Year’ by Special Olympics New York Central Region. 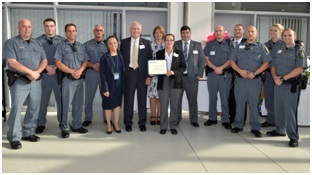 In June Your University Police Department was named ‘Campus Team of the Year’ by Upstate Medical University and was presented with the President’s Employee Recognition Award. 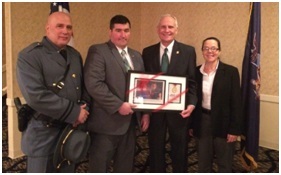 On November 15th the New York State University Police Chiefs Association met in Saratoga Springs to recognize and present to Officers Cohen and Giocondo the SUNY Chiefs of Police Life Saving Award. Chief D. Paul Waltz, University Police, & Public Safety have had the privilege and honor to be a big part of the New York State Special Olympics.